Earlier in the semester the Ross Student Government Association planned the event thinking it would be a nice idea to hold a special gathering as many American students and teaching faculty would not have the opportunity to be home with their families on the special holiday. Although not an official holiday in The Bahamas, the university took time away from a busy schedule to enjoy a 'turkey and all the fixings' meal served by the faculty. The meal was enjoy while watching televised football action on the multiple screens of the study hall. Dr. Harriet Myers, Ross University Associate Dean of Student Affairs offered words of blessing and thanks before everyone dug in to their Thanksgiving feast. To further promote the meaning behind the holiday, the Student Government Association decided to hold a food drive to benefit one of the island's local charities, and the Grand Bahama Children's Home was chosen because of its wonderful work with children in need. 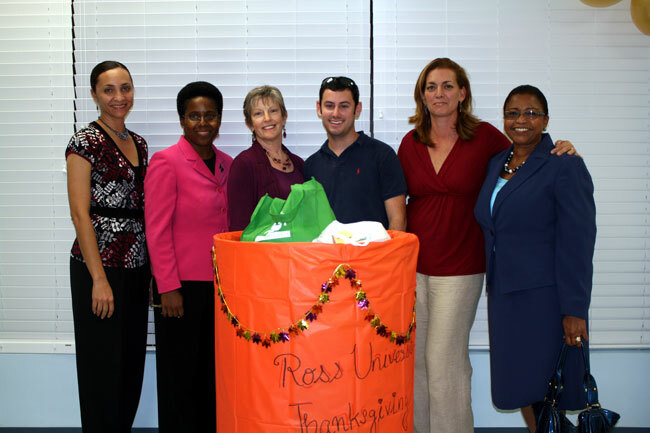 Members of the administration of the Grand Bahama Children's Home were invited prior to the meal for a formal presentation of food items collected by the university. "We are thankful for all we have, and being able to help less fortunate children on a day such as this one, brings out the true spirit of the holiday. We look forward to working with Children's Home in the future," said Christopher Riccard. Student Government Association President, Bahamas Campus, Ross University School of Medicine.